This painting by Norman Rockwell, Willie Gillis Girls with Letters, appeared on the cover of The Saturday Evening Post published September 5, 1942. This is yet another timeless favorite of Rockwell collectors, a classic for the ages. Another title for this painting is Double Trouble for Willie Gillis. This painting was Rockwell's sixth cover for The Post in 1942. In 1942, there were eight Norman Rockwell Saturday Evening Post covers published. 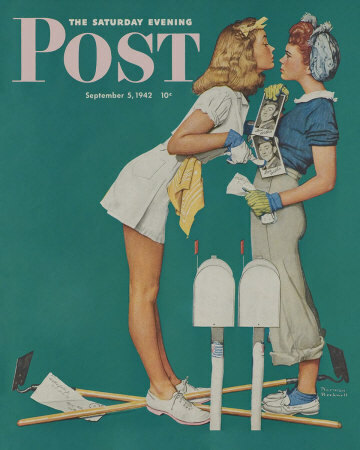 This was also the 210th overall of 322 total Rockwell paintings published on the Post cover. This painting was also Rockwell's 210th overall of 322 total pictures featured on the cover of The Post. Rockwell's career with the Post spanned 47 years, from his first cover illustration, Boy With Baby Carriage in 1916 to his last, Portrait of John F. Kennedy, in 1963. This is also the seventh in the Norman Rockwell Willie Gillis series of covers for The Saturday Evening Post. Rockwell painted eleven images that appeared on the Post cover and one illustration that was featured inside the Post. The original oil on canvas painting is currently part of a private collection. This classic Norman Rockwell painting shows two prospective girlfriends of Willie Gillis, America's boy next door..
Oh, that Willie Gillis! Did every American serviceman have as many sweethearts as he did? Not only that, but these two sweethearts are actually sisters. The models for this painting are the two daughters of artist and illustrator Mead Schaeffer, a close friend and neighbor of Rockwell. The pretty blonde is Lee and the gorgeous redhead is Patty. Both daughters, along with their father, also appear in the Christmas painting, Christmas Homecoming. Patty, the redhead, was also tapped to be Willie Gillis's girlfriend in another Gillis painting, New Year's Eve. In that painting, she is shown at home in bed, spending New Year's Eve alone, watched over by several photos of Willie. In this painting, the girls are shown arguing. Both received a photo of Willie in the mail. Both received the photo on the same day. The biggest problem is that they both went to their mailboxes at the same time. The photos received are identical in every way, right down to the "Love, Willie" inscription. Surely, the biggest question in their minds right now is who Willie loves more. But their main thought, after hoping he is alive and well, is "Wait till I get my hands on him!!" Willie may be longing for the war once these beauties get ahold of him. Both girls are apparently gardeners. Two gardening hoes are shown lying on the ground next to the mailboxes. Both wear gardening gloves. Willie Gillis Girls with Letters was only one of 322 Norman Rockwell Saturday Evening Post covers; Here is the list of Norman Rockwell Saturday Evening Post cover illustrations. Patty, the readhead, is dressed more appropriately for gardening. Lee, the blonde, is shown wearing a short skirt. Maybe Rockwell painted them in contrast to accentuate their differences. The blond girl certainly has longer legs than the redhead. Even bending down in her argumentative pose, she is the taller of the two girls. Another indicator of the tension in the painting is how the girls have treated the envelopes. Patty is crushing her envelope in her left hand while displaying her Willie photo with her right hand. Lee has dropped her envelope on the ground and is using her free hand to point at her photo of Willie. One question I would love answered: why are the mailboxes so short?